Please read these instructions carefully. You must follow each step exactly or you may not be eligible for our special rates. We advise NOT SHARING this with any reps as we are saving you hundreds of dollars a year by applying a discount and they may not be happy about it! • We recommend you bring your own device (BYOD) for this plan to avoid a contract. Any unlocked or Telus/Koodo phone will work. • You can get a device balance/TAB at Koodo and we are still able to discount the price. It will be our discount rate + phone tab (10$ to 21$) monthly once we finish. • Activate any NEW Monthly *not prepaid* plan with a NEW phone number (Maritimes residents: request an Ottawa number. Otherwise just take a local number). You can pick ANY monthly postpaid plan with or without a device balance as long as it is NOT a prepaid plan (pay in advance). • DO NOT transfer over your current number in store or you will lose it. Pick any NEW number at the store - we will change your plan first, and then transfer in your old number. • Please ensure you have tested the new sim card/phone at least once in your phone. • Once you get home from the store, create a Koodo Self-Serve account online. This is required before moving onto the next step. Visit koodomobile.com/my-account to register a self-serve account with Koodo. • If we are porting in a number from another provider for you, it will AUTOMATICALLY cancel that provider's plan when we are finished. Keep using the old providers sim/plan and do not end your service with them until our process is complete. • We can also provide a new number of your choice if you'd like - simply indicate it on the account submission form. • Once we have completed processing the account and you're all set, we will provide you with payment instructions. You do not have to pay until you verify and are satisfied. However, please make the payment in a timely manner to avoid plan cancellation. We accept payment via e-transfer ONLY. Beyond Bell, Virgin, Rogers, Fido and Telus there are more than a dozen cell phone companies across Canada. We have been able to secure some great exclusive plans. Canada Unlocking does the work to find exclusive plans for Canadians and gives you an opportunity to grab these great deals whether they are expired, special offers, out of province or grandfathered plans, we can get you the best deal that are not available on the market anymore. 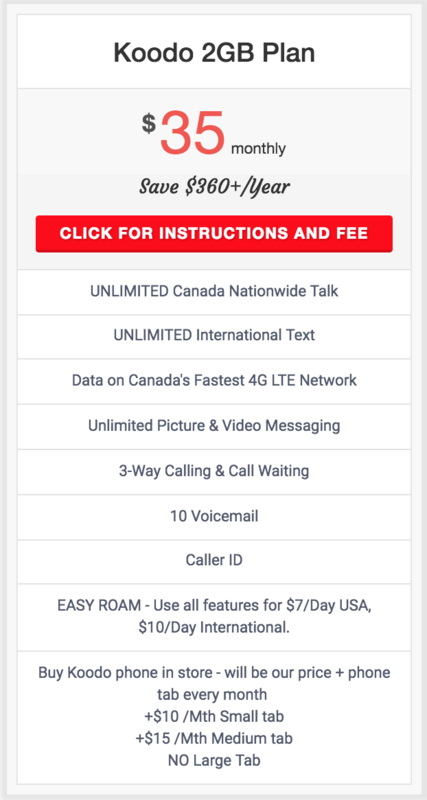 If you're in Saskatchewan, Manitoba, Ontario or Quebec, or elsewhere in Canada, we can offer you these great cell phone plans. Smart phones have become an integral part of our lives. We do more than communicate, we read, watch, and listen to the world around us on our phones. No cell phone companies in Canada offer truly unlimited data plans, however the best cell phone plans load your mobile plan with lots of data. The best Data Plan in Canada is the Koodo's unlimited text and talk plan that also includes 10 GB of High Speed LTE / 4G Data. 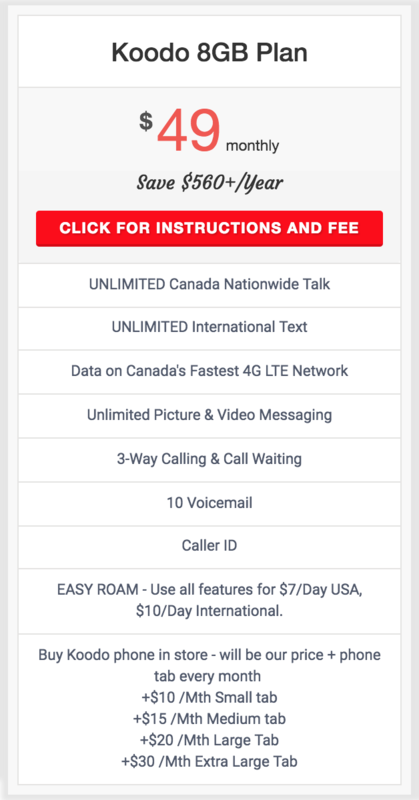 Not to mention it comes with other great features such as unlimited Canada wide calling, Unlimited international texts, as as well as caller ID, Voice Mail, and conference calling. You can even ROAM in the USA for an extra $10 per day. * If you are looking to save an extra $7 per month and can live without the extra 2GB of Data, then the $49 8GB Plan offers a great value. With WiFi available at coffee shops, schools, libraries, as well as at work and at home, many Canadians find the best cell phone plan doesn't need a huge amount of data. Whether you're looking for something low-priced to keep you connected, or a basic plan for your kids, talk and text plans let you pay for only what you need. The best talk and text plan is Koodo's $35 no-contract plan. Why we love it: We like this one from Koodo because it's their cheaper option at $35 but also includes 2 GB of LTE Data which is more than enough for the average user. 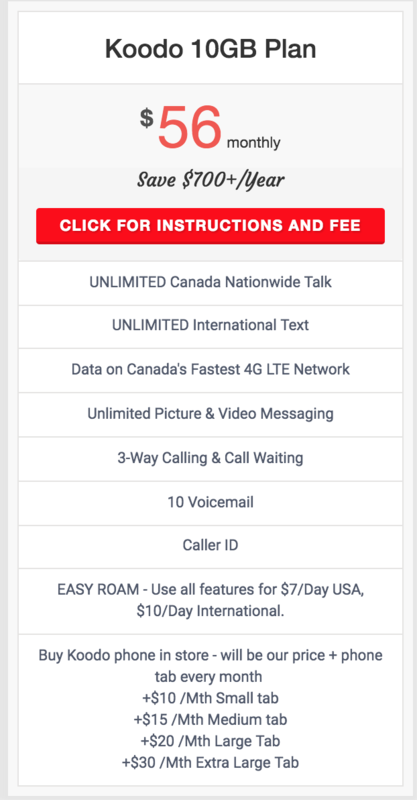 Not to mention it comes with other great features such as unlimited Canada wide calling, Unlimited international texts, as as well as caller ID, Voice Mail, and conference calling. You can even ROAM in the USA for an extra $10 per day. Includes 2 GB of Data and Unlimited Canada wide talk and unlimited International Texts. Emails and texts have given way to social media and streaming video. When we're on the go, we don't want to just be connected, we want to be entertained. Even the best cell phone plans in Canada have some of the most expensive data rates in the world. The more you know about how much data you use, the better you can pick the cheapest mobile phone plan. Canada Unlocking took a look at some of the most common online activities and measured how much data is used. Usage varies depending on how you use your cell phone, but have a look at the chart below to have an idea how much data is suitable for you. Question: How are you able to offer these plans? ANSWER: I have worked with 4 of the largest carriers in Canada. I have in debt knowledge about the mobile phone industry. There are loopholes to get you discontinued promotions, special offers, grandfathered plans or province specific deals. Question: What carrier are these plans with? Question: Do we have to be in Ontario to qualify? ANSWER: No - our plans are available to ALL Canadians. We have customers in every province enjoying these deals. Question: Can I keep my number? Question: Are these plans contracts? Question: How much is your fee? Do I pay upfront? ANSWER: Our fee is $89 per plan. We do not ask for payment upfront but rather when the process is complete. This means you have peace of mind. You can verify everything is completed and then pay us. Question: How long does the whole process take? ANSWER: Each plan only takes us 30 minutes. However, changes can only be made once your first billing cycle starts. This date is assigned to you upon activation at the store. It is chosen at random by the system and it is usually 2-12 days after you activate. There is no way to customize or choose your bill cycle date. There is NO way around this. We have to play by the carriers rules. Question: What is the process involved in purchasing one of these plans? ANSWER: Click here to access our step-by-step guide. Follow the simple guide to hop aboard! Question: I want to keep my number , why am I being asked to get a new number? Long answer: Continue to use your old service provider until we switch you over. Once we port your number, the service with your old provider will automatically cancelled. You can then insert your Koodo SIM and start saving! This is by far the most efficient way for this process. It is a tried and tested method which has been perfected over years! Question: Is there a chance I lose my number? Question: Got it - but doesn't the store require me to put the new SIM into my phone?